I was born in Barnham Broom on April 25th 1922 and lived there until I was seven. I went to school when I was three. I used to get tired in the afternoon and my teacher would lie me on a bed. My teacher's name was Miss Green. She lived at Welbourne. My father moved to Mattishall. We lived in an old cottage just up the Norwich Road. That time of day there were not many cars on the road. The windows would open on to the road. There was the Post Office on the corner, next to what was Stanley Fisher's butchers shop. Next to the butchers was Mrs Mitchell, then we lived in the middle and Mrs Blanche lived in the end one. There was a water pump next to our back door and when the neighbours came to get water it would shake the whole house. When the women wanted to wash the linen they would have to walk a quarter of a mile down the garden to hang it out. I used to love living there. It was near the school. My father worked for a man called Talbet Hill. He lived at Church Farm. On a Saturday morning I would have to go round the farm and clean the boots. I used to get 6 pence. If I finished before my time she would find me something else to do! I didn't mind Mattishall school but the master was a so and so. If you blinked you would get a wooden duster thrown at you. Down the road, where Parker Road now is, there was a blacksmiths shop. The old boy who kept it was Bedo Blanche. Us boys used to run down there to pump his bellows and he would give us one penny. The Swan Public House used to stand right near the road. The men used to go for a drink and when they came out of the Swan would stand talking and go off home and leave the bike standing against the wall. I left school when I was Fourteen. I never had any long trousers. My mother said she would make me some for work. She made me some out of a pair of Policeman's trousers. Well I had then got to look for a job. I got on to my bike and went up to East Tuddenham to see Mr Alston. I was so desperate for a job, I had got to pay for my bike. I bought this bike off Mr Hurren for three pounds, ten shillings and he let me pay so much a week. We were now living at No.5 Council House, Norwich Road. In the meantime I saw Mr Alston. He looked at me and said 'You aren't very big. What can you do?'. I said 'I will do anything you want me to'. He said 'Alright, we will try you in the cow house'. Well, I was absolutely scared stiff! I was still in there when the cows came in for afternoon milking. With a bit of luck Mr Alston came in. He looked at me and said 'You don't like this do you?' I told him I was frightened and would rather be with horses. I had to wait till morning. The next morning I went into the stable at 7 o'clock and the foreman told me I could go rolling. He told me where to go and what horse I was to have. Well, he was one of the biggest horses I ever did see. I got the collar and thought how am I going to get this on to you. I wouldn't be beat so I put the collar in the crib and climbed in and put it on. After that first day I never looked back. At 16 I was second team-man. The head team-man was a lovely fellow. We worked in well together. When there was any money to be earnt on the farm I would let him do it. At 18 I was head team-man. I could stack, thatch and drill. I used to break all the young horses. Believe you me, some of them were bad! I've been dragged and kicked from pillar to post. I've got the scars to show for it. Then the war broke out. I was going to feed my horses at 5 o'clock one morning and I met my boss coming down the road. He stopped and I asked what was the matter. He said there was a bomb about here somewhere. I went to work. He came and told me they had found it. It was right in the side of the main road. So, I had to go home by Hall Lane and tell all the men from Mattishall to come to work that way. Then I had to join the Home Guard. We used to drill in the old village hall at East Tuddenham. It wasn't very long before I was made Sergeant. Every time I had letters come to join the army, my boss wanted them and he filled them up. One night we had a lot of bombs drop in a line from North Tuddenham dummy airfield through to the common land at East Tuddenham. I had some horses on the common land. When I went to look for them one poor devil had his buttocks blown away and another one had a hole in its side. The craters are still there. Then one night I was going home after seeing to my horses and I saw what I thought were 2 parachutes. I rushed home and told all the men who lived in the council houses. I got my rifle as well as the other men. When we got there they were 2 land mines. I rode up to East Tuddenham to tell my boss as he was an R.A.P. Warden: The army came the next day to dismantle them. I can show you exactly where they were now. Then we had a 1000 lb bomb land in the corner of Doctors Lane. If that had gone off there would be nothing of Mattishall left. On 4th August 1945 I got married to Iris. We lived in Barrack Yard at East Tuddenham. One morning I got up at 4.30 am, opened the door and snow fell in, this was in 1947. Everywhere was blocked. Poor old Bloo Cook lived next door. I had to dig him out before I could get to the road. All the men Mr Turner the roadman could get together started digging out. The men from Mattishall started digging until they met each other. The first thing they did was to dig a trench so I could get through with a horse. Every day I would have to go down to Mattishall to get provisions to take back to Mrs Alston and she would let the people of the village have them. That year on the 15th May I was drilling sugar beet on the aerodrome, a big field as you are going to East Tuddenham, and there was still snow lying on the headland. Up the Hockering Lane there was a search light post with 11 soldiers. I got to know them quite well, in fact, one of the wives and two children came to stay with my mother all the rest of the war. In the meantime, I was still doing Home Guard duties and I was now an officer. I shall never forget when I was drilling wheat on what we call Sand's Farm, all of a sudden, the earth shook. There was a doodle bugg landed at Welbourne. The horses I had got I managed to calm them down but there was a lot of damage done. One poor fellow was working his horses at Welbourne and his horses bolted and pulled his finger off. When I was courting my wife Iris, she lived in a farm house in the woods near Weston aerodrome where the Yanks were. Her mother used to say it is 10.30 pm - you ought to be going home. If not you will have to stay here till after the Yanks have got home, as they would run you over. I had two children, Margaret born 5th September 1946 and Michael born 1St August 1947. I used to play cricket a lot and when I put my white clothes on they would scream like mad. A lady lived up the road, named Frances Bugg, she used to take Margaret. One of the girl Fennels would take Michael, so Iris never had any trouble with them. I was going to tell you about Mattishall's 5 pubs: The Swan, The White House, The Cross Keys, The George. The Ringers. There was also the Maltings, 6 shops, 2 garages, a cycle shop, fish and chip shop, a harness maker, hair dressers and 2 blacksmiths. The hairdressers was a wooden but stood in a yard next to the old vicarage. A chap by the name of Berty Bell, he had a wooden leg would put a basin over the heads of us boys and cut round it. He charged tuppence. Where the doctors surgery is now was an orchard. When we were playing football on the school playing field we would kick the ball into the orchard. Then slip through a gap, get a couple of pockets full of apples and slip back again, hoping the old Master didn't see you. At the end of the orchard was Grief's Garage, he used to charge accumulators for wireless sets, also he would sell paraffin. Next to the garage were green fields until they built a couple of bungalows. Opposite the garage was the school. The toilets were near the road. There were holes in the boards of them and some of the other boys kidded me up to sting the girls backside with a nettle. They kept look-out and said 'Here come one'. Well, I stuck the nettle through the hole, heard a yell, and I was gone like the clappers - but not quick enough. It was a teacher. I wont say no more But I don't think I could sit down for a week! Next to the school was Mr Horne's Funeral Parlour. I think the chapel of rest is still there. Next to that was Billy Long's farm. On the opposite side of the road was Moat Farm where Mr Lawrence farmed. There was the chapel and up the yard next to the .chapel was the knocker's yard. Then on the other side was the blacksmith's yard and two shops run by Miss Palmer and Mr Leveridge. If you asked Miss Palmer for some fags she would say if the Lord wanted you to smoke he would have put a chimney on your head. Mr Leveridge, what a character, he had a boy work for him. They used to go out in the evening with groceries. While they were out this boy used to throw stones at the van and shout 'They're after us again'. Mr Leveridge called the police. While the police were there nothing happened. After some time the police waited in his own yard and caught him. Over the other side of Welgate was George Harrison's cycle shop. He would mend a puncture for two pence. If you got a puncture and left your bike with him he would lend you one till the next night. Well, going back to the Home Guard, I was sent to Dorking in Surrey for training with hand grenades and sticky bombs. It was good training. When I came home after 3 weeks I had to take our platoon to the sand pits at the bottom of Hall Lane. We had dug a trench there. Well, I started them off on dummy grenades which went off alright. They all made fun of that. Now, I said, we will have the real thing. Some of them had never seen a real hand grenade before so I spent some time showing them what to do. I got four of them in the trench, gave each one a hand grenade and said 'Right, now listen to me. Put your grenade in your right hand. Now put your four fingers of your left hand in the ring of the grenade. When I say pull you pull the pin out of the grenade and keep hold of the leaver. When I say throw you throw it'. One bloke by the name of Billy Riches dropped his. I never moved so quick in all my life, I dived for this grenade and threw it out of the trench. That is where my army training come in! He never touched a grenade no more! There was a dummy aerodrome at North Tuddenham. Old Mr Haw Haw used to say, on the radio, that the Germans had given North Tottenham a pounding. But that night all they did was drop bombs on open land. I can take you and show you several holes which are now used as pits. There were Yankee bombers coming home one Sunday morning to Weston. We stood in the yard watching them. All of a sudden one of them top-sided and burst into flames. It landed down Garveston Road. There were none of them poor devils escaped. We went to see if we could help but it was a terrible sight. In 1949 we moved back to Mattishall in an old cottage at the end of Doctors Lane, next door to the doctors. It wasn't a bad old cottage. The only trouble was that the toilet was a wooden shed up the garden. When Iris or the children wanted to go I would have to go up there with a stick and rattle the door to get the rats to run out. I have caught several. We had an old boy live next to us his name was Bob Leeder, you might have heard of him - one of the dirtiest old devils going. My wife used to take him a bowl of hot water to wash and shave. One Sunday Bob had been at the White House for a pint or two. As he came home up the lane he laid down and fell asleep. We had a new policeman in the village trying to find his feet. He came along, kicked into Bob and woke him up. My boy Michael was up the lane with his 2 goslings. He told the policeman 'Leave Bob alone - he's my Bob'. With this the policeman wanted to know who he was and where he lived. Well, Michael came home crying, the goslings behind him. `The policeman has got Bob'. I went on to the road and there was the policeman and Bob. He said 'Is this your little boy?' I said 'Yes, and he has done no harm'. He said 'No, but he was up the lane with this old fellow'. I said 'So what? He is a friend of mine'. He said that he would not have Bob sleeping on a public highway. Anyway, we got over that one! Then I got a council house on Parkers Road. When I told Bob he cried like a child. I told him not to worry and that he could come down there every day if he wanted to. I don't think there were many days he missed. I looked out he kept clean and I used to cut his hair. I told him that if he wanted to come and see me he would have to keep clean. I looked after him until he was taken into Gressenhall Workhouse - not as bad as it sounds! While I was on Parkers Road I got a job as a milk rounds man. I worked for Ray-Mar Dairies. It was a dairy up South Green. We had some laughs while I was there. I remember Ray had a new man start. Ray told him not to go into the yard till I got there. Well, Margaret said 'Sid is here' so they let the Alsatian out. She came bounding down the yard thinking it was me. Instead it was the new man and the dog took the arse out of his trousers. Good job he saw the funny side of it! My boy Mike worked with me and Ray used to give him so much a week in a pay packet. He used to put them in a drawer in his bedroom. One day, his mum saw these packets in his drawer so she put them all together. That was it! When he came home he asked who had been in his drawers. His mum said she was clearing out his bedroom when she found them. He said 'Right, you've had it now. I was going to take you and dad out for a meal. I shant now'. And he never did. Bless his darling heart. People kept saying what a bad winter we have had. When I was on the milk round I was going to work one morning. I got as far as Gallow Green pit and hit a snowdrift that put a stop to me. I tried to open the door but I couldn't. I sat there trying to shunt back and forward. That got to 5.30am and we were frozen with cold. I was worried about the boy Mike. He kept saying that he was alright. Well, I looked out the back window and I could see some lights coming. My heart jumped for joy as I knew it was back. He had a spade and he managed to get my door open. I said 'Thank God for you jack. We managed to get the van back into Mr Farrows farm yard and turn round. I got home about 8am. We were frozen stiff. There were some women waiting for the bus to go to work. I told them what had happened and they said they would wait a little longer. But, there you are, the road was closed right through to Dereham. We went home and had a nice hot bath. Iris ran the water for us as we were so cold that she thought we might scald ourselves. This was in 1956. It was such a hard winter that our diesel even froze up. We could not see out of the windscreen. The milk was frozen in the bottles and the cream on the Jersey milk stood out of the bottles like soldiers. I remember going to one woman. She kept the Post Office at Marlingford. She always had a mug of cocoa waiting for us. She said 'what is the milk like this morning, boy? I want the tallest one you've got'. She would take it and put it straight into her cocoa. The Policeman stood against Marlingford Bell and he would tell me what the roads were like through to Colton. That was a big help. I was going up to Colton Negroes Head one morning when the van turned round and got stuck. With some luck the brewery lorry was down there and the men came and helped me out. I was going round Elsing one Saturday and this particular woman always wanted me to look in the fridge to see how many milk bottles she had got left. I had always got to make sure she had 3 pints. Well, this morning I went in and there she was stretched out on the settee and I could not wake her up. She was out cold, so I went tearing off down to the farm to get Jack her husband. Mrs Jones rang the ambulance when we found out she had been bitten by a cat. The ambulance men said it was a good job I went when I did as she would not have lasted much longer. That was one episode but not long after that I went round to the same house again, opened the door and the kitchen was alight! I shouted. She had gone upstairs and left the stove on. Off I go again, down to the farm, to find Jack and ring the Fire Brigade. I would love to see that person to see if she could remember those times. I once went round Swanton Morley Camp when it started to snow and before I could get round my wheels began to spin. The R.A.F. pushed me so that I could get round. When I first got to the camp in the morning I would meet the Duty Sergeant and Officer at 7 a.m. The Sergeant would come to the Officers Mess and Sergeant's Mess to deliver milk for their breakfast. One morning I pulled up outside the Guard Room to pick up the Duty Sergeant and the Orderly Officer would not let me leave the Guard Room as he said I had got no pass. I told him my van was my pass. Well, it wasn't long before the cook from the Officer's Mess came for their milk. I said 'Do not touch that milk. If I can't come the milk is not going'. Well someone got in touch with the Commanding Officer and he came to see what was going on. I told him what had happened. Five minutes after I was on my round, with some help. At the time Dereham Training Centre was being built Peter Crate invited me to go and look round. It was a lovely place. I was very impressed with it all. Peter said 'Now, we want some fund raising done' and I said 'All right, I'll do some'. I shall never forget the first night I started, we had a Bingo. There was snow on the ground. I think there were 12 people there and some of them gave me their prize money back. So I got about £12 profit, by the next time we had a Bingo the Centre was open so we moved up there. I used to go out and pick people up and I arranged for a mini-bus to go as well. As we got things going I used to get over £100 profit. My wife, Iris, and I used to run dances, car boot sales and craft fairs, which all helped to raise money. I got a summer house, caravan, several computes all for the mentally handicapped. I was treasurer of the Gateway Club for 25 years. I was a founder member. We each put a £1 in to start the club off. Altogether I raised £147,000 for the mentally handicapped. Dereham Day Service had all the receipts to show this is correct. I met the Queen to received the Maundy Money, that was a lovely day out. Iris and I used to love fund raising. We met a lot of friends. We have had Robert Wolfe the organist from Thursford to play for us 3 or 4 times. Also we had Nigel Boy Syer and Hayby Moyses several times. I lost my son Michael 3 years ago, bless his heart. I miss him a lot. When we lived at the 4-10 Mill Street I was looking out of the bedroom window when Iris asked what was wrong. I said that every time I looked out of the window I could see the boy Mike, so I would like to move. The next thing I knew, she had rung up Bob Carter Court. We moved in there in February. Iris and I had a lovely time there until she was taken ill in April the following year. She went into hospital and passed away on April 16th. So, there is just me and Margaret. Margaret lives up at the Oaks in the village. I still call Bingo once every 2 weeks at Lakeside Lyng, every 2 weeks at Hockering Meeting Point in Dereham, every month at North Tuddenham and once a month at Bob Carter. This all keeps my mind busy - Sid Everett. 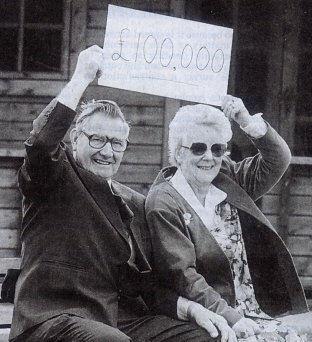 Sid and Iris became fund-raiser for charities supporting people with learning disabilities over their lifetime the raised over £147,000. For his contribution to charity he was awarded Maundy money from the Queen in her 70th birthday year. He was choosen to receive the money at Norwich Cathedral on April 4, 1996, the first time the ceremony had been held there. Iris passed away on April 2nd 2009 peacefully in hospital aged 80years. The funeral service and interment was at Colney Wood Burial Park, Norwich on Thursday, April 16th 2009 at 2.30 p.m. Following her death Sid would always make sure he still got out and about as much as he could to his functions and especially to visit his daughter Margaret who lives in Mattishall. As time went on walking was becoming more of a problem. At home he had the company was Olly his pet cockateil. On October 6th 2015, Sid passed away peacefully in hospital, aged 93 years. Beloved husband of the late Iris, devoted dad of Margaret and Michael (deceased.) Will be sadly missed by all. Funeral Service and Internment at Colney Wood Burial Park, Norwich on Wednesday, October 21st at 11.30 a.m. Family flowers only please, but donations, if desired, for the RNLI, may be given at the service or sent c/o W C Littleproud and Son Family Funeral Directors, Hale Road, Bradenham, IP25 7RA.